Social/ Emotional: This week we will focus on classroom community/ working with one's peers. We'll learn how to handle a situation when a peer is "bugging" them, how to work cooperatively with each other and how to treat each other in daily interactions. Writing: We ended up not finishing our first Small Moments writing pieces last week. We have completely edited our papers and we'll write our final drafts this week. We'll also finish this week with a writer's workshop sharing party to celebrate and share our writings with our peers! Reading: Guided reading groups are in full swing. During guided reading groups, each child will receive individualized instruction to enhance and progress their reading skills. With grade cards coming out soon, you will be informed of your child's reading levels and the supports they are receiving during guided reading time. The short passage we are reading this week is about a scarecrow who is upset because he can't scare birds away. As we read this passage, we'll talk about the main character and their feelings, the problem and solution, vocabulary seen in the text and making text to self connections. To make connections to our social/ emotional studies, we're reading the story Chrysanthemum this week. As we read this story, we'll make text to self and text to text connections and think about how we should treat others. Word Work: This week and next, we'll be reviewing our sight words and word families that have been introduced thus far. Social Studies: Last week, the students learned about the Presidents: George Washington, Abraham Lincoln and Barack Obama. We also learned the history of and facts about our American flag. This week we'll learn about the bald eagle, Liberty Bell, Statue of Liberty and Mount Rushmore. Math: We're continuing to move through our exploratory addition and subtraction unit to and from 20. 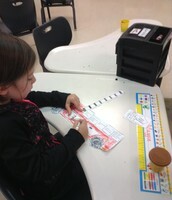 The students are exploring with math racks and playing games to learn different strategies for addition and subtraction. 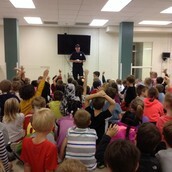 Here's a picture of the 1st grade fire fighters presentation. During the presentation, we watched a fire safety video, learned fire safety tips and had an ask and answer session. We had a lot of questions to ask these fire fighters! Later in the afternoon, I read the kids a fire safety book. 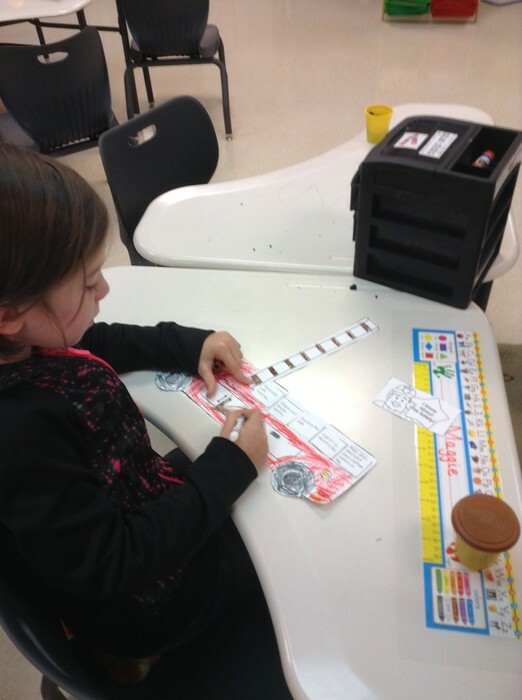 We also made fire trucks and glued on different fire safety tips. Here's a picture of Mr. Bradley reading to the kids. 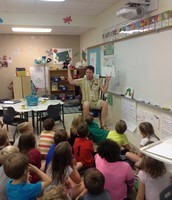 The kids loved listening to him read as well as talk about his favorite place to visit! He'll be coming back to read to us throughout the year. We added one more Pawfect Award to our window last week in PE! Our classroom family continues to grow stronger with respectful, hard working first graders! 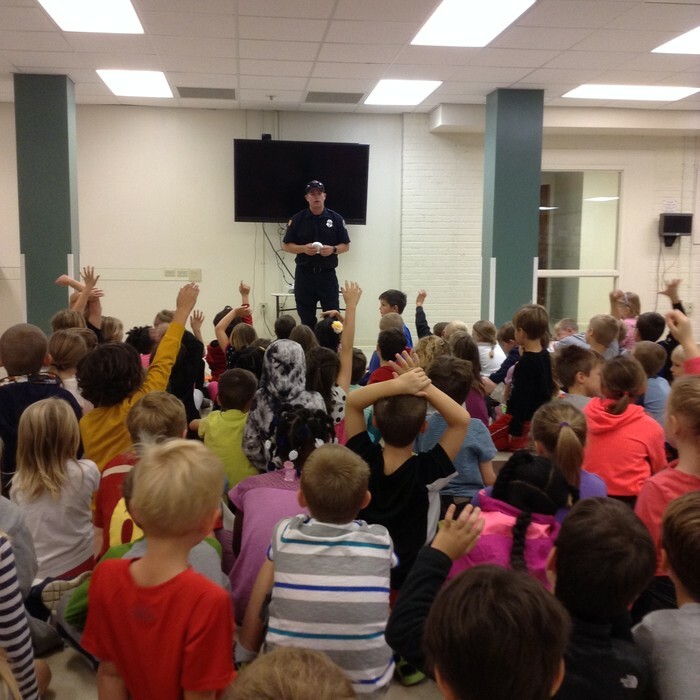 On Monday the Kirkwood Fire Department came and presented fire safety tips to kindergarten, first and second graders. We also completed a class fire safety truck project. Last Thursday Mr. Bradley, a 5th grade teacher, came to read to Mrs. Pryor's and my class. He read the Giving Tree by Shel Silverstein to the kids. After reading, he spoke to the kids about his favorite place and had the kids share their favorite places to go as well. 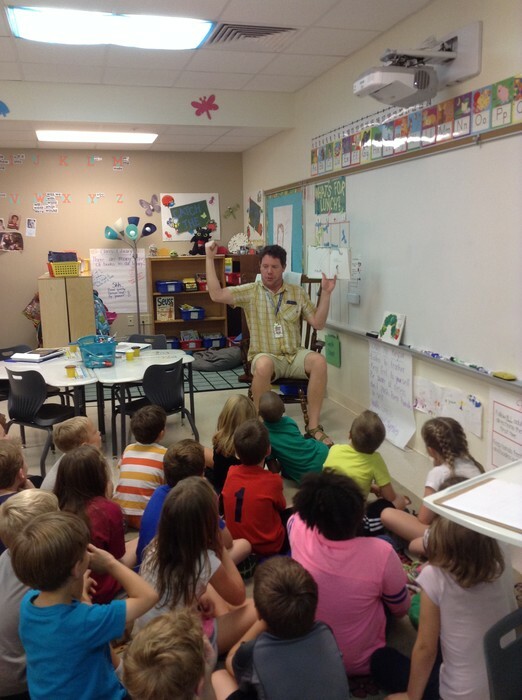 It was a treat listening to Mr. Bradley read this great story! Our class will be taking a walking field trip to the Kirkwood Farmer's Market on Friday, October 23rd. Please look for an email from me explaining further details about this field trip. Our school's annual leave raking day is Monday, November 2nd (also an early release day). We'll be doing this community project with our 3rd grade buddies in Ms. Weiterman's class. Dr. Hogg has emailed you with more information about this community project in addition to a sign up for parent helpers and donating needed supplies. Please let me know if you need any further information or this email sent to you again. There is no school next Monday (10/19) and Tuesday (10/20). I'll send out our newsletter next Tuesday. Thursday, October 15th is our 5th grade MADCO performances at 2:30 and 7:00 p.m.
Their is a PTO meeting at 7:00 p.m tomorrow night (10/13). October Scholastic Book orders were sent home last week. Orders are due Friday, October 16th. You can order with the paper form or with my online code: P8W3C. PHEW...There are a lot of things to look out for in the upcoming week(s)!